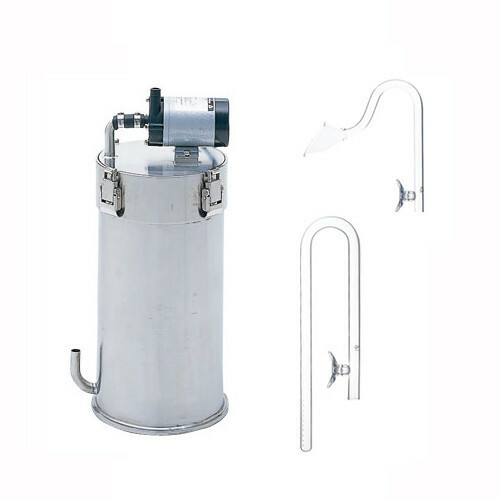 Super Jet is a canister filter made using high grade stainless steel to guarantee longevity. Each Super Jet comes equipped with an Iwaki pump to ensure the most consistent flow of water into the aquarium possible. Because we designed the pump to sit on the outside of the canister portion of the filter, it enables easy cleaning and a more steady flow rate due to preventing organic waste from clogging the pump. Most aquarists prefer canister filters for their effective filtration of aquarium water and flexibility of filtration media layers (effectively housing mechanical, biological and chemical filtration layers) and for their ability to the best flow rates of any filter type. However, most canister filters suffer from poor design and look ugly underneath the aquarium or are made out of plastic that’s subject to cracking. That’s why we’ve applied the same great design principles to our Super Jet series and crafted them using stainless steel. Every Super Jet includes everything you need for your aquarium filter system: a matching pair of Lily Pipes, Clear Tubing, Bio Cube (mechanical filtration), Anthracite (high grade carbon chemical filtration) and a filter media net. For nano aquariums such as Mini S, Mini M and 30C, choose Super Jet ES150. You can also use ES150 on Cube Gardens as large as 45-P or up to 10 gallons. Super Jet ES300 is a more powerful alternative for Mini M, 30C and 45-P and can be used effectively on aquariums up to 16 gallons (such as Cube Garden 60-P). The primary difference between ES150 and ES300 is that ES300 provides more canister space for filtration media and a higher flow rate. ES150 can hold 1.5L of filter media and has a water flow rate of 3.5L/0.9 gallons a minute. ES300 holds 3L of filtration media and the pump filters 6.0L/1.5 gallons of water a minute. Super Jet ES600 is designed for Cube Garden 60-P and can be used up to Cube Garden 90-P (40 gallon aquariums). Super Jet ES600 has a filter media capacity of 6L/1.5 gallons and water flows through the pump at 6.0L/1.5 gallons a minute. Designed with two purposes in mind,VUPPA is used in nano aquariums as a simple filter or in larger aquarium as a way to provide either surface skimming and water aeration or supplemental filtration. Clear filter tubing maintains the aesthetic of Lily Pipes and transports water from filter to aquarium and vice versa. Hand-crafted in Japan using only the highest quality glass, Lily Pipe V series (inflow pipes) is designed with minimalism in mind. For inflow pipes, the less they appear in the aquarium, the more time is spent enjoying the aquascape and less time looking at the necessary life-sustaining filtration system.